VIVA Films and the IdeaFirst Company proudly bring you their first movie offering for 2018 about love, commitment and marriage, MR. AND MRS. CRUZ. A film written and directed by Sigrid Andrea P. Bernardo, the same director who gave us last year's highest grossing film, "Kita Kita." This time, director Sigrid Andrea P. Bernardo talks about the thing that comes with love, but no one wants to really talks about: Commitment. MR. AND MRS. CRUZ is the story of Raffy and Gela who went on a vacation to spend time in Palawan, but instead found themselves enjoying each others' company. As they spend more time together, their unconventional love story begins and flourishes. But soon enough, trouble in paradise arises as their views in love, commitment and marriage clash. Will they see it though the end together? Once again, Director Sigrid Andrea P. Bernardo creates a masterpiece that will hit the heart and hit reality. 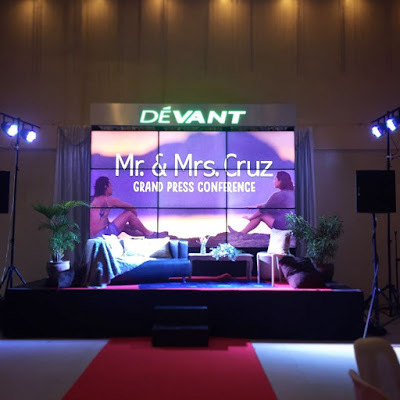 MR. AND MRS. CRUZ boasts of its stellar casts JC Santos and Ryza Cenon. It is the first time for JC an Ryza to pair up on screen, but the chemistry between the two stars is uncannily ndeniable. Ryza Cenon on the other hand is one versatile actress, whose acting career blossomed in 2017 via the romance horror film "Ang Manananggal sa Unit 23B". Her potrayal of Georgia in GMA-7's Teleserye "Ika-6 na Utos" is considered to be her breakthrough role, earning her a Best Supporting Actress nomination in the 2017 EdukCircle Awards. MR. AND MRS. CRUZ, which was shot entirely in the picturesque and breathtaking island of El Nido Palawan, will bring all kinds of mood and vibes on screen, that will send the audience on a roller coaster ride of emotions. Add to that the heart-tugging soundtract performed by the hit group, The Juans an Nicole Omilio tilted "Istorya" and "Before I let You Go" (originally by Freestyle). Shooting the film was a challenge though. "Literal na buwis buhay" as Director Sigrid describes it. In one of their shooting days, the ream was almost got trapped in exclusive beach where they filmed some of the scenes for the movie. "Sobrang chill lang kami. Nagkakantahan pa in between shots, not knowing na super high tide na pala sa labas ng exclusive beach kung saan kami nagshu-shoot. Bago ka kasi makaratign doon sa exclusive beach, kailangan mo munang pumasok sa isang cave. Sinasabihan na lang kami ng guide namin na kailangang na naming lumalabas dahil malakas na ang ulan at mataas na ang tubig sa labas." So, lumalabas pa lang kami ng cave ramdam na namin na mataas na talaga yung tubig. As in, kailangan mong sumisid para makalabas ka." Valentine's Day will come early this 2018 when Mr. And Mrs. Cruz opens in cinemas on January 24.